wide angle photography under the right lighting conditions. I like to keep people out of my images so that the viewer feels as though he or she is the only one in that peaceful moment. Creating that feeling can be a challenge in Southern California, but it's still possible as you can see below. 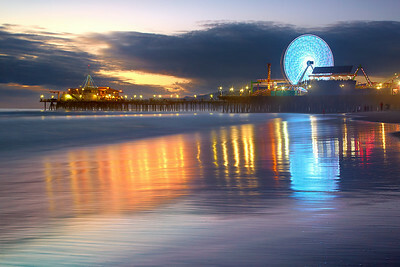 The fourth in the Santa Monica Series shows the new wheel just after sunset. I waited again for the sand to briefly become smooth and for the ever-changing color of the wheel to be complementary to the blues in the sky. The wheel does not spin very often so it takes a while to get it right. 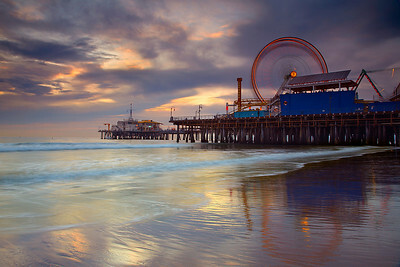 The third in the Santa Monica Series shows the new wheel just before sunset. I waited for the sand to briefly become smooth and for the ever-changing color of the wheel to be complementary to the warm glow of sunset. The wheel does not spin very often so it takes a while to get it right. 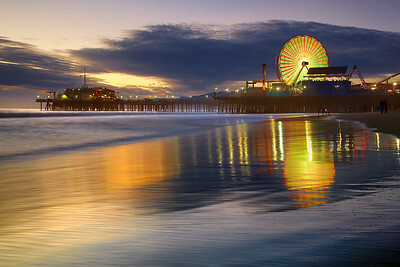 A medium-length exposure shows the spin of the wheel, as riders enjoyed a magnificent sunset over the Santa Monica Pier. This was the best part of a great sunset, then I waited for the lights on the pier to become as bright as the sky in order to create Santa Monica Spin #2 about 20 minutes later. For a brief moment in between waves, the sand turned glossy, so I made sure to capture that moment with the wheel in motion, which was not very often during the best part of the sunset! 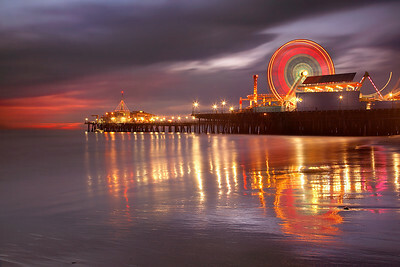 This image was taken about 20 minutes after “Santa Monica Spin1.” An extra long exposure and a little light still in the sky allowed the scene to become evenly lit. The wheel spun about 5 times during this exposure. The spinning wheel turned out to be the most import factor to getting a good photograph. Sometimes the wheel stopped, and the dynamic feel of the resulting image was lost. Sometimes it would turn too quickly and become out of synch with the way the lights on the spokes worked, creating odd-looking effects. So a lot of experimentation was required to get a smooth and dynamic look without distracting features. Improvisation is often required to get the best photograph possible. 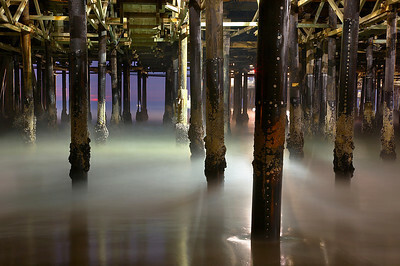 It was like another world under the pier at sunset. 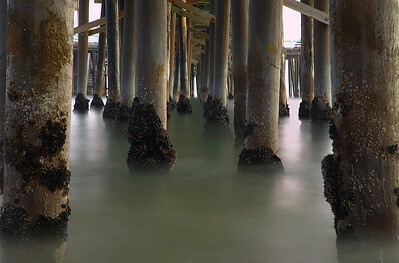 The lights allowed extra detail to be seen on the vertical pilings, while a long exposure softened the water. It took a while to get the best vantage point where the fewest pillars were blocking other pillars while still showing glimpses of the ocean beyond. And I had to avoid the bright lights, which would become seriously overexposed and ruin the image. 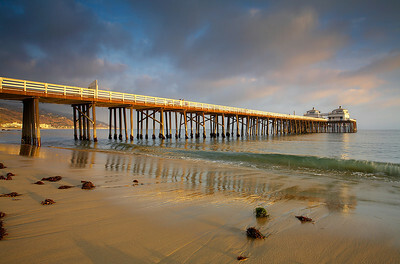 The last rays of sunlight peeked though the clouds, bathing the Malibu Pier and the hills in the distance. The waves were small, which allowed lots of light to reflect off the water and the sand. The sunset behind the camera was excellent with lots of color in the clouds, but I liked the light on the pier even more. Many times, it is best to point the camera away from a nice sunrise or sunset because the light will be superb on the land and sea opposite from the sun. I also like how the small bits of seaweed cast long shadows on the sand. 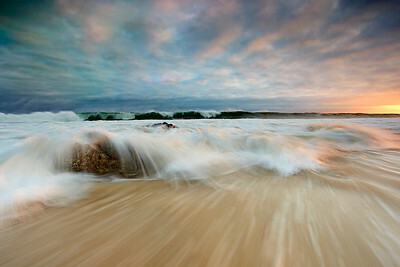 Small waves and low tide allowed lots of detail to be shown during this long exposure. This was another one where it took a while to move around in order to have as few pillars blocking other pillars as possible and still show detail on the front ones. And I wanted the front two pillars to frame the image, which complicated matters a bit. I was driving along the South Orange County coast towards my intended sunset shooting location when I saw this nice set of waves breaking offshore at Crystal Cove State Park, between Laguna Beach and Newport Beach. I abandoned those plans because there was a nice opening in the low fog layer right here, perfect for the sun to drop through, so I headed down to the beach. I watched the waves for a while to see how I could capture the distant waves breaking at the same time as a foreground wave would break on some rocks on the beach. I had to wait about 3 minutes before the coincidence happened and I missed the first one, so I waited a few more minutes, and then I finally caught it just right. The water was only about one foot below the camera on the tripod for this exposure!